I really love a roast on a Sunday and my favourite thing in the world is roast potatoes. But sometimes, especially in summer you just need something a little different and lighter. This recipe for Roast Chicken, Veg and served with Orzo could not be simpler. Every time I make it, hubby complements it and the orzo gives it a lovely comforting feel. It's the pasta equivalent of risotto rice without all the fuss. So it's an adaptation of a Nigella recipe but I've left out the olives (& sometimes the lemon). You can never go wrong with a Nigella and the good thing is that it's Slimming World friendly too. Pop your lemon inside the chicken with a couple of Rosemary sprigs poking out. Let the birds legs be free (remove the string). Roughly chop your veg and put them in the bottom of a roasting tin (that's been spritzed with fry light). Pop your chicken on top of the veg and add a few more rosemary sprigs around. Roast at the recommended heat and time on your chickens packet. Near the end of cooking put a pan of stock on to boil (I used 300ml of water and chicken stock cube). Add the orzo (we have about 75g per person). Cook the orzo for around 8 minutes or until it's soaked up the stock and is irresistibly sticky. Plate up your orzo, add the vegetables on top and drizzle some of the pan juices to it. Carve chicken and add to the plate. As a mother there is always a never ending 'To Do' list of all the things you need to remember or do or take to school (or make for school). But what's worse is the mundane things that keep reappearing or never drop off the list. Seriously that woman is worse than Cinders for losing her shoe in our toy box, for at least 20 minutes out of every day I question, then have a paralysing fear that my boy has eaten it before finding it matted in Barbie's hair (there is an 'accessories' box but it seems Elsa doesn't want her shoes in there) so each day it stays on the list. My husband always sighs heavily and now it's got to the point that any plastic related feeding containers, cups, bottles, he just leaves them on the work top and it's left to me to ram them back in the correct cupboard. It's at that point I think of my 'to do' list and mentally think 'I need to reduce the plastic explosion'. Sometimes they just have to blink and I think they grow out of something I've only just brought them, it's funny because I mainly route things out when it's left to hubby to dress the children. He manages to squeeze them both into clothes that are too small, leggings that barely come up to my girls knee's and my poor little boy looks like a muscle man in his rather too tight and short T-shirts. I recycle lots of clothes in quick succession. So the kids have a toy box that is bursting with toys and yet they either play with each others toys or the odd balloon, cardboard box or washing line that gets left in their way. They both have toys that they no longer play with until the moment you mentally or physically think of giving to charity. It's like they have a sixth sense about it all. So consequently we end up just adding to the pile and it stays on my list. As I riffle around for dinner items that are beige and loved (and more importantly eaten) by my children, I always come across a random small pot of something delicious that I've cooked up for one or both of them. My hands hovers and I wonder if I should do a pot luck dinner but can I take the fall out if it is indeed chilli (which the girl hates now..even the smell triggers a 20 minute meltdown from her). So I decide to leave it on the list and identified, label and stack neatly next time I come this way. I wouldn't say my girl tells lies all the time because I'm not sure she is but she is starting to get creative with words and how she uses them. I truly think she believes what she is saying and sometimes she is so convincing that I too believe every word she says until it gets a bit unbelievable. 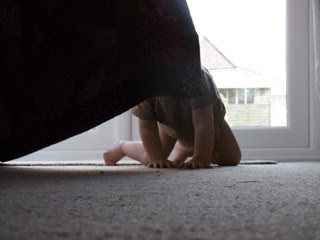 This week she even had a tantrum because I'd questioned her on a certain version of events and she was then heard screaming "I'm not fibbing mummy, me's telling the truffs"
It turns out she wasn't telling the truth. The other day she was telling me that her class went to the pet shop and saw cats and dogs, it was only when she told me the dogs were blue and the cats pink that I realised it was in her imagination (but hubby checked at school the next day just to make sure). She is convincing and doesn't flinch or even blink whilst telling her tall tales. I finding it chilling to the bone that she is testing out her new found skill and can sometimes be very good at it too. She can remember her embellishments and recount them again a few days later, if I wasn't the one who bares the brunt of them, I'd find it very clever. Yesterday she convinced my mum that she ate peanut butter off the floor with daddy!!! It was only when my mum recounted it back to me that I pointed out that we don't have peanut butter in the house, she wouldn't be eating it off the floor if we did and I'm not sure she's even tried it to be honest. But the point is that she was so convincing that my mum was taken in (bear in mind that my mum doesn't take prisoners and has dealt with both my brother and I and my two nieces over the years...so is well versed in little untruths). How am I to cope with a surly teenager who is aware of what she is saying and is rather good at lying. I'm not going to know the half of it am I but that's probably a good thing really. If you are ever over on Pinterest (I'm here by the way) you will probably have seen lots of very elaborate small fairy gardens. Well we didn't make one of those but we did come up with a toddler and preschooler version in our garden. I admit I got over excited in the garden centre and possibly brought too much much to my husbands chagrin! Bubba got very involved and was scooping large handfuls of earth into the pot and all over the grass, luckily cub was already in bed and it was a lovely sunny evening so we planted up the tubs before bedtime. I still want to add some other plants, especially some gypsophilia which I love and is very fairy like. There was a lot of cleaning up to do afterwards! For cub we put together a dinosaur pot with lots of succulents and rocks which can be picked up and touched. Bubba got very involved in this one and swept the garden looking for fossils to put in herself. Even now she adds more stones every time she goes in the garden so it's looking slightly fuller. We plan to make some more and dot them around the garden because it has got my girl more interested in plants and planting things (and watering, don't get us started on watering as she is keen on watering the plants and herself liberally!). 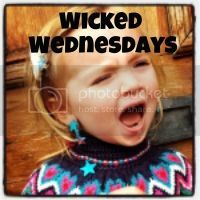 I'm linking up with Wicked Wednesday today. Pictures of normal family life. I brought some quark recently as I wanted to make a nice creamy pasta bake but didn't in the end so googled (don't you just love a bit of 'what can I do with this?' type googling) different recipes and found a chocolate mousse one - best bit was that it's 1/2 syn a portion and to anyone doing Slimming World, this is a massive bonus. You need a tub of fat free fromage Frais, an options sachet, a table spoon of sweetener and half a tub of quark. Anyway I put together a little video of what I did...so simple. Just put all your ingredients in a bowl and mix...then chill...then scoff. It'll be up here soon or check out my YouTube channel The Bubbababble. This little girl taught me to smile even before she arrived. I'd hear her heart beat or see her on the screen and I'd look in wonderment and dream of the ways my life would change. A small flutter turned into a swift kick from a perfectly formed miniature foot and already she was making her mark on me, taking a piece of my heart. Little did I know that this one girl would change me totally. I've become a better me because of her, I'm learning all the time with her and she makes me look at the world through different eyes every single day. I watch her sometimes, happily playing and can't quite believe I/we got so lucky. Today this little person had her first induction at 'big school' and I anxiously watched her go in. The excitement was brimming over in her which was magical to watch but my heart felt stretched, I ached to go back to having my baby again...just one more hold, one more nuzzle of her perfect little neck. For it to all uncomplicate itself and to not let her go. She sees me as a constant, I see her as more transient, flying and soaring above me on wild adventures. It makes me smile at the thought of her experiencing a wonderful life. But my heart pulls even further apart. I can't quite remember her growing up, it happened in the blink of an eye. 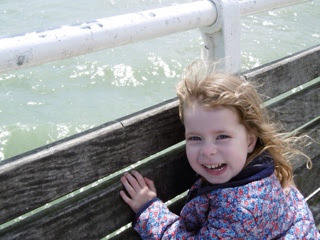 Pictures of a cute and dinky toddler replaced with a long limbed cheeky smiling mini adult. Sometimes she drives me to distraction with her moaning and whining but my love never falters. If anything I love her more, she's feisty and strong willed yet can be the sweetest girl. I can see the trauma of adolescence ahead and the terrible threes behind us and right now I want to stop time. We used to love having Fajita's (and still do) but since being a Slimming World convert I don't like the extra calories involved with using wraps. We've tried with Thins but it just isn't the same so I decided to do away with the bread aspect all together and just have de constructed fajits instead. I then added my vegetables to a pan with a bit of fry light: including pepper, sweetcorn, onion, mushroom, garlic and added some black eyed beans and the spice mix and let them all slowly cook, turning every now and again. In went some already roasted chicken from our Sunday roast, I follow the Nigella recipe that is so good and I'll put the recipe up here soon. I chopped up some tomato and spring onion for a salsa, added a touch of salt and mixed and left in the fridge to let the juices combine. I then grated some cauliflower and microwaved it for a couple of minutes, this was in place of rice. We usually do rice and some peas but seems that I usually do too much and we end up feeling bloated. Once the veg was cooked (I like it slightly crunchy) it was time to layer up. Rice on first and then the mixture with salsa and cheese. It's a family favourite now. As we are now in the middle of a heatwave all thoughts turn to paddling pools in the garden (well they do if you are a mum of two small people). This is always better in theory than in practice as this week I spent 35 minutes getting the kids into swimwear, slathered in sun lotion and the paddling pool filled...we then spent 15 minutes in the pool before they decided it was too hot and we all came indoors. But the point is that we did it and we had fun in the water and it was all helped by my boy in his Huggies Little Swimmers. These are great because they give me peace of mind that there won't be any leaks or things floating past us in the pool and my boy can easily move around in the water. This is due to the special leak guards which are built into the nappy and help to make sure nothing gets out that shouldn't which is always helpful when you are in the swimming pool. I can safely say it's not even something that crosses my mind when he's got them on which makes the whole experience more relaxing for any mother and it all becomes much more fun. A happy baby and a happy mummy. The unique absorbent material also means that the nappies don't hold onto the water (you know when you get a normal nappy wet it puff's up to about 18 times its normal size, well with these it doesn't so nothing gets in or out) so when you remove the nappy you haven't got a huge water logged sponge to deal with. The nappies have other uses to as I came into the room yesterday after locating the suncream to find the kids had emptied the whole of the swim nappy packet and were playing Nemo - well Bubba was, cub was trying to put the nappies on his head! So they both love the Disney designs too which is a nice touch really. My boy loves any opportunity to splash around now he realises what his hands are for and is starting to enjoy being in deeper water than the bath, recently on holiday we took him swimming for the very first time and he cried for the first 15 minutes and clung to me but by the end of our holiday and having taken him every day he started to love being in the water. Using the nappies are so quick and easy to put on and I think it makes my little boy feel like a big boy wearing pull up pants rather than being laid down to have a normal nappy on. We used Huggies pull ups for Bubba when potty training and we will use the same for cub when his time comes now I know he likes the idea of being in nappies that pull up. It's lovely to be able to take him swimming because I used to take Bubba all the time, it's nice to see them enjoying water. We are arranging to go swimming in our local pool weekly now, just the cub and I whilst bubba is at school, then at the weekend we will all go as a family so my girl doesn't miss out. There is so much information on the Huggies website with advice and how to introduce babies to swimming.